Journal, which were those published between Autumn 1995 and Spring 1999. Daniel da Cruz, an expert on the Middle East who has written regularly for Aramco World, gives a short history of the Hejaz railway up to 1965. Hemered Bamidbar, describes Aaronsohn’s involvement with the Arab Bureau. Lawrence’s desire to explore the methods and techniques of other writers led him to meet a number of distinguished authors in the 1920s and 1930s. Ton Hoenselaars and Gene Moore, co-authors of this article, have written on a subject which has received little attention. In his article T. E. Lawrence and the Translating of the Odyssey, 1928-1931 [Vol. III, No. 2], Jeremy Wilson provided an interesting account of Lawrence as translator. Dr Norman Postlethwaite, Head of the Department of Classics and Ancient History at the University of Exeter, has looked at the translation from a different viewpoint. Society member Andrew Lownie, who has published a biography of John Buchan, looks at the friendship between Lawrence and Buchan. Alun Lewis (1914-1944) is recognised as one of the most important British writers of World War II. Stationed at Bovington Camp in the 1940s, he visited Clouds Hill, inspiring him to write this fictional short story. Robert Bolt’s screen play for Lawrence of Arabia received some strong criticism and he wrote Apologia to explain his approach to the subject. Taking Plutarch as his model, the author has made a comparison between the two lives. Nadeem Elissa wrote a thesis on the Cairo Conference as part of his MA degree at the School of Oriental and African Studies, University of London. Most of his thesis is included in this issue. He describes the discussions that took place before, during and after the conference, and the resulting decisions which played such an important part in Middle Eastern history. In her investigation of Lawrence’s musical activities and opinions, Clara Marvin has written on a subject which deeply interested him but one that has received virtually no attention in the literature since the 1930s. Malcolm Brown writes about his thoughts and experiences when editing Lawrence’s letters. St. John Armitage draws attention in his article on Lawrence and Henry Williamson to fallacies which too readily find their way into print. The decision to issue Hejaz postage stamps in 1916 provided Lawrence with an opportunity to participate in an artistic activity which must have come as a welcome, albeit brief, respite from wartime privations. It is generally accepted that Lawrence knew at an early age that he was illegitimate, though there is insufficient evidence to establish how much he really knew. The Ways of Transgressors puts forward an alternative interpretation. In 1996 Nick Lynch completed his third journey to the Middle East, this time through the Wilderness of Zin. As on the previous occasions, he has written up his desert travels. H. St. J. B. Armitage: Lawrence: Life and Legend or Sense and Nonsense? St. John Armitage provides a critical appraisal of the second edition of Lawrence James’s biography The Golden Warrior. illustrations that took place at the Leicester Galleries in 1927. The third article, by Liddell Hart, reviews the first trade edition of Seven Pillars in 1935. Father Bertram’s paper on brass rubbing provides a useful introduction to the craft and gives an indication of why Lawrence was so enthusiastic about this activity. Oxford at the time when Lawrence was searching building sites and collecting potsherds, and relates how he established a rapport with Assistant Keepers of the Ashmolean, C. F. Bell and E. T. Leeds, which developed into lasting friendships. Looking at the relationship between Lawrence’s unmarried parents and its effect upon Lawrence. An experienced bookseller expounds on the buying and selling of books, with all its ramifications. Analysing Lawrence’s relationship with Thomas Hardy and his possible influence on Hardy’s later poetry. Simone Weil’s life and proceeds to discuss the reasons she found Lawrence such an absorbing person. The author of a number of books including The Images of Victorian Oxford, Dr Malcolm Graham is well qualified to describe the Oxford of Lawrence’s boyhood. Deserta ‘is a great book for the simplest and most sufficient of reasons: it is a direct enlargement of human experience.’ Also it provides a background that gives the reader a fuller appreciation of Seven Pillars of Wisdom. 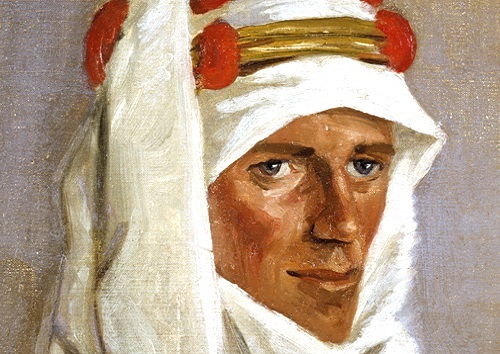 From a series of talks entitled The Spell of Arabia, broadcast on the BBC’s Third Programme in 1947, we have taken Sir Ronald Storrs’ contribution, Charles Doughty and T. E. Lawrence. Martin Young’s father, Major Sir Hubert Young, first met Lawrence at Carchemish in 1913 when Young was a Lieutenant in the Indian Army, before serving with him during the Arab Revolt and then at the Cairo Conference in 1921. We are fortunate in being able to publish here, for the first time, not only his son’s article on that first meeting, but photographs taken by Young at Carchemish. Peter Metcalfe has unearthed some of Lawrence’s service records which we have reproduced here. When Sir Ronald Storrs introduced Lawrence to Lowell Thomas in Jerusalem in 1917, it marked the beginning of an association between a leader of the Arab Revolt and a notable American journalist. Professor Claire Keith’s article makes extensive use of the Lowell Thomas archives at Marist College, Poughkeepsie, New York. In this article, one of a series entitled Railways of the Near East published by the Railway Magazine in 1934, Major D. G. Heslop writes of his experiences helping to restore the railway line between Damascus and Medina in the aftermath of the Arab Revolt. Major Claude Scudamore Jarvis succeeded Lieutenant-Colonel W. F. Stirling as Governor of Sinai in 1922. In the following thirteen years he acquired an extensive knowledge of Arabic and Bedouin customs and established a reputation for settling tribal disputes. This article is taken from a chapter in Three Deserts, one of his books relating his experiences in the Middle East. A comparison of the 1922 and 1926 versions of the Seven Pillars chapter titled Myself, applying a method used by the Bibliothèque de la Pleiade. Harold Orlans’ sociological interests and the four years he spent in London after the last war have prompted him to write here about Lawrence’s political views. Robert Franks discusses the number and variety of names that Lawrence used. The writer H. M. Tomlinson writes here about his impressions of the great, and tells of his first encounter with Lawrence. and a small team of British officers participated in the Arab Revolt during the closing months of the War. Part I of Claire Keith’s paper [Vol. VII, No. 2] was a result of research work she carried out in the Lowell Thomas archive at Marist College. Here, we publish Part II, which concludes Claire’s examination of this singular episode in Lawrence’s life.